The plan for 2018, to the extent that a plan can ever be said to exist, was to enter a long race in each quarter, culminating in the Beachy Head Marathon at the end of October. The first quarter was taken by the Brighton Half and, for the second quarter, a new race caught my eye. It was a Bank Holiday Monday out-and-back, from Newhaven Harbour to Brighton Marina and back, making 15 miles, and organised by Multisport Management, the people responsible for the splendid Adder in Friston Forest. I entered. As the day approached, I had some attacks of nerves and anxiety. In training I’d run some long-ish distances and been disgracefully slow. My knee, and hip, had been giving me gyp. And, to undermine my confidence yet further, on the Saturday before the event I ran a disgracefully slow parkrun at Peacehaven. I thought about staying away. I also thought of scaling down from the full fifteen miles, and running the shorter 15k which turned at Saltdean. In the event, I found a deeply hidden reserve of resolve somewhere and turned up, knowing that I had no choice but to do the whole thing, no matter how much it hurt. The tone was set as we ran up the hill towards Newhaven fort. I held my own up the hill, but as soon as we reached the top of the cliffs the rest of the field took off, leaving me far behind. I hadn’t run this way for some years. It used to be a route I took for marathon training, but it must be a few years since I came this way, and the cliff erosion is noticeable. After Newhaven cliffs, the route runs parallel to the main road, staying on the top. Peacehaven, pas the meridian line, Telscombe Cliffs, Saltdean, where we had water, and then up the hill and down into Rottingdean. As I was the last runner, the genial tail bikers kept me company. I took pains to assure them that I was going to finish inside the cut-off of four hours. 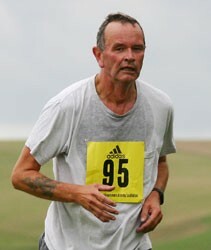 It’s a long way from Saltdean to the Marina, but I reached there at 1:43, so a finish at roughly 3:30 was on the cards. Here the route went down, to run back along the under cliff - relentless sun, reflected off the cliff-face and the sea, and a hard surface. At Saltdean we ascended once more, to run on the cliff-tops until Howard Park, where we plunged down to another seaside grilling, followed by every runner’s nightmare, stairs,182 steps up to the cliffs. I still kept a good pace going, and my knee didn’t bother me as much as I thought it might. I was the last, but I think there’s no disgrace in finishing last on such a day. My Garmin gave up the ghost, but only just before the finish. For fifteen years I have run on the downs in my part of Sussex, but for some reason, I have never run over Mount Caburn. Today I rectified that, with the help of Duncan, CharlieCat to his intimates, Race Director of the Moyleman, and agronomist to the Sussex gentry. After a Lewes Twitten run, refreshed by the traditional coffee, I mentioned that I wanted to do this, to add some extra distance in readiness for next weekend’s Newhaven to Marina 15 miler. I asked Duncan for directions, knowing he runs up there regularly. Not only did he give me directions, he agreed to accompany me. So off we went. There’s a stiff climb up Chapel Hill, then a ridge that eventually overlooks Ringmer. In the fog, the view were diminished, but not so much as to spoil the day. On we went, up to the very summit of Mount Caburn, inhabited by some handsome cows. Duncan is usually generous with his farming knowledge, but, uncharacteristically, I had to extract from him by force the information that these were Sussex cattle. Then there was a long descent. Here I was a long way behind Duncan, who runs as does the sure-footed ibex. He told me that the lunatics of Lewes AC run up here on winter evenings by the light of head-torches. After running along the bottom of a blissfully quiet valley, we ascended again. I know now what we put the poor Moyleman runners through, and, which is encouraging, feel much better about next weekend’s event.